Researching for exhibitions brings me in contact with art that I perhaps wouldn’t have discovered otherwise, which is usually a good thing. The Scottish Colourists were a group of fascinating artists, of which Samuel Peploe (1871-1935) was a leading member. The four members of the group, who were active in the 1920s, were from Edinburgh, and all were enormously influenced by what was going on artistically in France. While much of the art being created in Scotland was stylistically stagnant, in France Impressionism had developed into Post-Impressionism, from which Fauvism and Cubism sprung with the dawn of the 20th century. Peploe maintained a strong individualism as a painter, but borrowed aspects from his European contemporaries – particularly when it came to colour. In this work, Still Life, Pink Roses (1926), you can see parallels with Cézanne, who also experimented extensively with the still life tableaux. 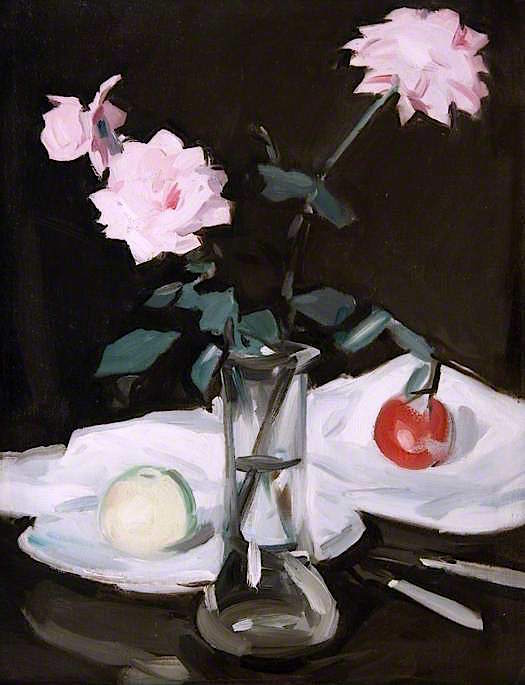 Using a stark black backdrop – a brave technique that artists like Manet and Courbet also favoured – Peploe cleverly places his still life objects in a balanced way, while retaining a sense of spontaneity. In the foreground, a glass vase of water holds three beautiful baby pink roses. The brushstrokes are thick and directional, echoing the painterly style of the Cubist‘s. The petals and leaves are almost faceted, angled and graduated in tone to create shape and light. The red and green fruit behind are set on crisp white plates and napkins, creating a strong contrast with the darkness behind. The colours in the painting are few, but juxtaposed with white and black they really jump from the canvas, particularly the pink on black. The light is quite evenly distributed with very little shadow or texture, which gives a flatness to the work. Peploe did not play with perspective in the way that Cubists did, which makes the arrangement more traditional, perhaps betraying his Scottish roots. I love that the composition is so closely cropped, it feels very modern and almost diagrammatic. The cutlery in the foreground is literally depicted by just a few white and grey strokes, and the reflection in the vase is made up of a few well placed daubs of paint. I think what really appeals to me is the fact that it is seemingly simplistic, but upon closer inspection you can appreciate the artist’s eye and the way he has taken something so elementary as a still life and turned it into something sophisticated and avant-garde.